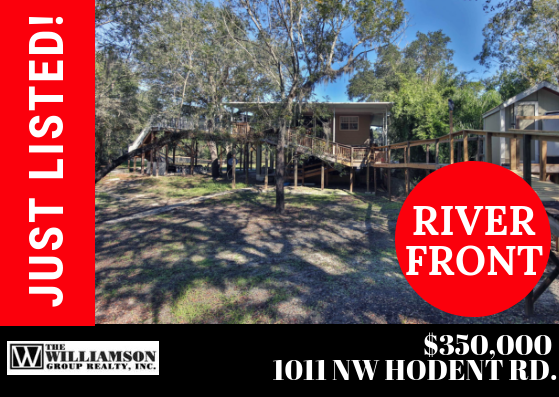 GORGEOUS THREE BEDROOM TWO BATH HOME WITH 435 FT OF RIVER FRONTAGE, A PRIVATE BOAT RAMP ON THE HISTORICAL PEACE RIVER, WITH SCREENED IN OUTDOOR KITCHEN AND BAR FOR ENTERTAINING AND ALMOST 6 ACRES FOR PRIVACY. This home has all the extras beginning with a whole home generator for power outages, a brand new roof installed in 2017, central vac system, 2 rooms with full Murphy furniture systems, a beautifully updated kitchen, master suite with walk in closet and built in organizer system, 2 full RV hook ups with 50 and 30 amp service, a private boat launch, boardwalk beside the river, outside bathroom for clean up after your boating, fossil hunting or fishing on the river, barn with stables, extra 2 car carport, storage shed, workshop with horse stalls, fenced and cross fenced area for your animals, trails for hiking or ATV/recreational riding, pond, large screened deck off of the home, lovely walkway with dock out to the river, grill and refrigerator for the outdoor kitchen, grand oaks, native plants and wildlife included for no extra cost. Call today to see this one of a kind, private peaceful dream home with all the amenities you could ever want with low energy bills. Get away from the hustle and bustle and come enjoy nature at its finest.